Like the rushing thrill of driving at full speed? Yes, everyone does. Some pay their cash to ride on a roller coaster and some drive a Ferrari. But not everyone can drive full-speed without getting arrested and not everyone can experience the thrill of speed. That is where video games come in. These ingenious programs help us evade our quotidian and escape into a completely different world. Though nothing beats the thrill of real speed, the emulated experience is something you make do with unless, of course, you’re serious about making a career in F1 racing. Already, there are thousands of games that adorn the somewhat clustered car racing genre in video games. And day-by-day, the numbers keep piling. 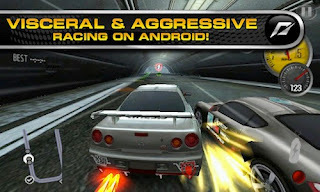 Bringing the same excitement to your little smartphone or tablet computer come the latest collection of car racing games for Android. EA’s classic comes to Android with this graphically polished title. 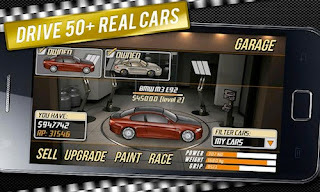 The game lets you drive over 20 cars including BMW M3 and Lamborghini on 18 realistic tracks. You can either play the career mode or just take a test drive using the Quick Race mode. Though the gameplay is not as enticing as other games on this list, it still offers some of the best and the most realistic graphics you can have on Android. With 42 cars that you can flaunt in your own 3D garage, Asphalt 6 brings the best racing experience you can have on Android. The game features 11 different leagues and 55 different events, which, though enough for any adrenaline junkie, are incomplete without the amazing multi-player experience that the game provides. Quite simply, this is one of the absolute best titles on the list. Providing absolutely stunning graphics comes Real Racing 2 from EA. Sticking true to its title, the game provides realistic racing using 30 officially licensed cars that you can try out on a huge 16-car grid. The career mode offers 10 hours of racing in 15 different locations making the game worth your time. 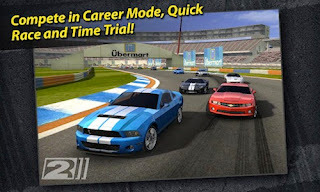 Rated 3.5 out of 5 stars, Real Racing 2 is freely available for download from the Google Play Store. 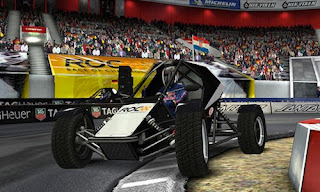 Allowing you to race in London, Dusseldorf, and Barcelona comes Race of Champions, a fun free game that makes racing even more exciting. With realistic graphics and an impressive set of gaming modes, Race of Champions never fails to impress. You can either try Championship mode or flaunt your skills on online charts using the duel mode. The time challenge mode on the other hand lets you race against the clock using a ghost car. Worth a try if you’re into some serious racing fun. 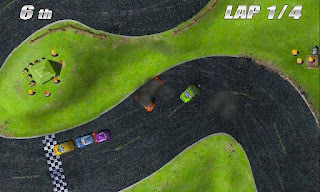 Putting a twist to normal racing comes drag racing, an innovative little game that lets you drive around 50 cars and race them either against NPCs or against some fierce online gamers. The game is simple, you start with a car, you tune it, and then it is up to you to beat all the opponents and drag your wheels away to glory. If your car is expensive, the game gets even harder to beat both offline and online. For upgrades, you can add nitro and other stuff to make your spins more accurate. Furthermore, the game relies on cash you earn during matches. If, however, you’re a little short on it, then you can earn some quick bucks in the Drivers Battle. Overall, Drag Racing is a fun game to try out if you’re a little bored with the traditional racing games. 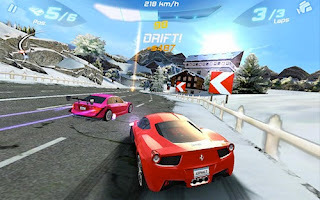 Providing another unique racing experience comes Tilt Racing, a game wherein you have to ‘tilt’ your phone to control the vehicle. The game provides a top-down view of the tracks, allowing you to race on up to 10 tracks and with 6 different cars. Much like the aforementioned Drag Racing, Tilt Racing features a unique racing experience that makes it stand out amongst other games in the genre. 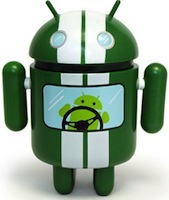 You can either control your car with the accelerometer or you can use the touch screen. Overall, the game seems quite nice if you’re looking for something fresh in this genre.